"vi faccio vedere come muore un italiano!" 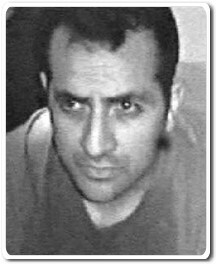 (May 9, 1968 – April 14, 2004) was an Italian security guard taken hostage by Islamist militants in Iraq, notable for his defiance of captors shortly before being killed. He was taken hostage together with Umberto Cupertino, Maurizio Agliana and Salvatore Stefio. They worked in Iraq as security contractors. Quattrocchi's kidnappers forced him to dig his own grave and kneel beside it wearing a hood as they prepared to film his death, but he defied them by pulling off the hood and shouting "vi faccio vedere come muore un italiano!" -- "I show you how an Italian dies!" He was then shot in the back of the neck. The Arabic television station Al Jazeera refused to show the videotape of his death, saying it was "too gruesome". Many commentators have celebrated Quattrocchi's defiance and suggested that he ruined the propaganda value of the video by refusing to submit to his captors; some claim this may be a reason Al Jazeera refused to show the video. Cupertino, Agliana and Stefio would later be freed in a bloodless raid by US troops, that former Italian prime minister Silvio Berlusconi said he had approved beforehand, just before an important election in Italy which was, however, a defeat for his party. The Italian Department of Anti-terrorism Strategic Studies (DSSA), an organization accused of establishing a clandestine network for influencing politics with illegal methods – possibly including kidnapping and murder, claimed that Quattrocchi was operating in Iraq on its behalf. Quattrocchi's DSSA association was subsequently denied and the assertion is thought to be false because he was actually working for a US-based security company. On March 20, 2006, Quattrocchi was posthumously honored by the Italian president Carlo Azeglio Ciampi with the Gold Medal for Civil Valor, after a proposal by the Home Secretary Giuseppe Pisanu. Quattrocchi's death has been a highly divisive issue among the Italian public, which, despite widespread loathing of both Saddam Hussein's late regime and Islamist fundamentalism, is mostly averse to participation in the Iraqi war. The Left, though praising Quattrocchi's personal courage and dignity, does not believe that giving him the Gold Medal was justified. They claimed that he and other security personnel and contractors in Iraq are essentially "mercenaries". Another source of controversy is the fact that other Italian victims of the Iraq war were not awarded similar honours. 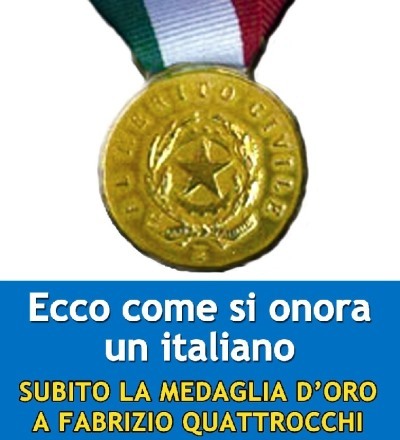 The relatives of the victims of the Nasiriyah attack of November 2003 (in which 17 Italian servicemen and two Italian civilians were killed by a truck bomb) complained that while Quattrocchi was awarded the Gold Medal, those Italian soldiers were awarded with the "Croce d'Onore" ("Honour Cross"), as posthumous honour, even though they were in service as regular soldiers, unlike Quattrocchi. 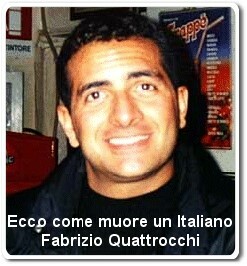 For this reason, according to them, the victims of the Nasiriyah attack deserved such an honour more than Quattrocchi. Giuliana Sgrena, an Italian left-wing journalist who was also kidnapped in Iraq, complained that no similar honour had been awarded to Nicola Calipari, an Italian intelligence agent killed by American friendly fire during his rescue in a rather controversial episode. Similarly, Sgrena remarked, neither was Enzo Baldoni, another Italian journalist kidnapped and killed in Iraq, awarded any honour. But for the Gold Medal for Civil Valor to be awarded, one act of specific Valor is necessary, and that phrase, "vi faccio vedere come muore un italiano!" — "I show you how an Italian dies!" was considered to be of high significance, despite the unclear circumstances of Quattrocchi's presence in Iraq. As the leftist side was not enthusiastic about the award, the rightist parties Alleanza Nazionale and Forza Italia (Silvio Berlusconi's movement), insisted in their PR campaigns that Quattrocchi was a hero. They accused the Left of being unpatriotic.